The William Jewell College Concert Choir will be releasing their third album April 1, 2018. 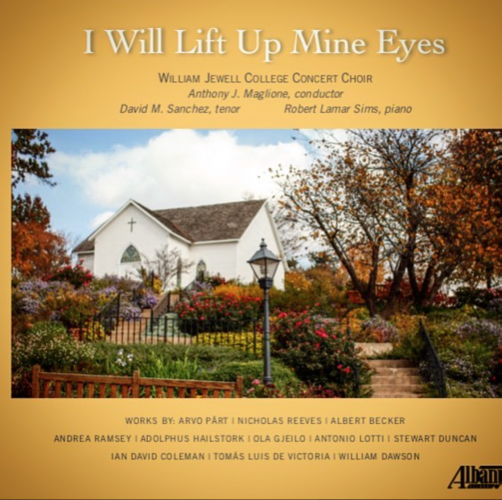 The album, “I Will Lift Up Mine Eyes,” is their second international release. Anwar Robinson, American singer, songwriter and musician, served as a guest conductor at Jewell last year while associate professor of music and director of choral studies Dr. Anthony Maglione was on sabbatical. Robinson introduced the choir to the central piece on the album, a three movement cantata by African American composer Adolphus Hailstork. “I think we all sort of fell in love with it,” said Maglione. Maglione began researching the piece and found that no recording of the piece in its entirety has been produced. The choir gathered money through donations and grants and began to put the album together. Current Jewell choir members, Jewell choir alumni and faculty took part in the making of this album. David Sanchez, Class of ‘14, is the tenor soloist for the Hailstork piece. Two newer works are done by Dr. Ian Coleman, professor of music and department chair, and Stewart Duncan, Class of ‘15. Luce-Virlynn Apollon, senior nursing and Applied Critical Thought and Inquiry (Act-In) major described the process of making an album. “Not many people are aware of how much work and attention to detail go into making an album. Yeah, we sing the same portion of the song over and over again—with so many voices a slight difference in each take makes a huge difference. There would be times where we sang a passage perfectly but an 18 wheeler drove by and ruined it,” said Apollon. Senior music major Jackson Ritchie further described the detail that goes in to the process. “[It] begins with working through and getting to know each piece of music musically, theoretically and poetically, so we can perform each piece exactly how the composer intended it to be performed. Then after a year of practicing the music, we spend around two days on a weekend at a church, since they have really good acoustics, and we’ll record each piece. Dr. Maglione will take us section by section of each piece and makes sure that every note is perfect and that we are truly singing as an ensemble instead of just singing the notes on the page,” said Ritchie. The choir traveled to a church in Belton, Mo. to produce the album. “The space was really warm and resonant so it helped create the sound we were looking for…Overall, I loved the experience. We did some of our best singing in that room,” said Apollon. A hard copy of the album can be pre-ordered on Amazon. Within the first week after its release, it will be available to stream on Amazon, iTunes, Naxos and through the recording company itself. About ten days later it will be available to stream on Spotify. “I am incredibly excited for people to hear all of the work we’ve done. Dr. Maglione always does an incredible job of choosing literature for our choir that is both challenging musically and spectacular for those listening to it. I know all of the work we put into the album and I know that people will be impressed that this came from a small liberal arts college in Liberty, Mo,” said Apollon. After the release of their CD, the Concert Choir leave May 14 for a two-week tour of England and Scotland. The choir will fly into London and stay at Harlaxton Manor. The first part of the tour will have performances at Ely Cathedral and a church in Nottingham as well as visits to York and Cambridge. Then they will travel to Edinburgh to perform at St. Giles on the six concert series. They will return to London and perform in Oxford. All of these events are open to the public and advertised by the venues. The venues will have free-will offerings to recover the costs of hosting. The Concert Choir has been touring England since 1985. Then chair of the music department, Don Brown, originally designed the tour. Even though Brown retired in 2004, he still plans the tours. Brown and his wife, Helen, both former faculty at Jewell, will travel with the choir. “I’m excited for [the choir] to make music in these ancient spaces, these 13th and 14th century cathedrals. I think it’s going to be remarkable,” said Maglione. For the choir members, the trip is something to look forward to. “I was a first-year last year and the seniors that are this year, I was friends with all of them and they’ve all just totally hyped it up and told me like what the entire experience is like so getting to kinda go over there and like fulfill that and like do some of the things that they got to do when they were first-years is going to be super cool,” said sophomore music performance, nonprofit leadership and Act-In major, Spencer Ruwe. Ritchie was one of the seniors who went on this tour his first year. “The trip to Europe my first-year was one of my greatest experiences and created so many lifelong memories with my friends. We visited many great places that were unknown, non-tourist spots, that were hidden gems for me and made my experience unforgettable,” said Ritchie. He is excited to experience this again because of the music they are performing. “Another experience I can’t wait to have again is performing music written for the specific cathedrals we’re performing in so we can see how the original composers heard the music and how they experienced the music they wrote,” said Ritchie. Maglione incorporated both traditional English and American compositions. “The English folks really like hearing us sing folk hymns and spirituals and American compositions. They really think that’s authentic I guess which it is kinda cool cause you grew up hearing these sounds so you know when you hear an ensemble come from another country and another culture and they bring their own, a little bit of their homeland, it’s really exciting,” said Maglione. The variety of pieces excites Blair Walker, junior music education and education major. “I like singing their music to them and showing how well we can do it but then also singing our music in terms of like we’re singing a bunch of songs that were composed in American literature and then a bunch of English compositions. And I like showing that we appreciate their culture but then to also show them ours,” said Walker. Feature photo courtesy of William Jewell Photo. Thanks for the article about our new album!